Summer is almost over and the crisp East coast air is on its way. The change of seasons brings much relief as heat and humidity is tough for urban dogs in NYC. 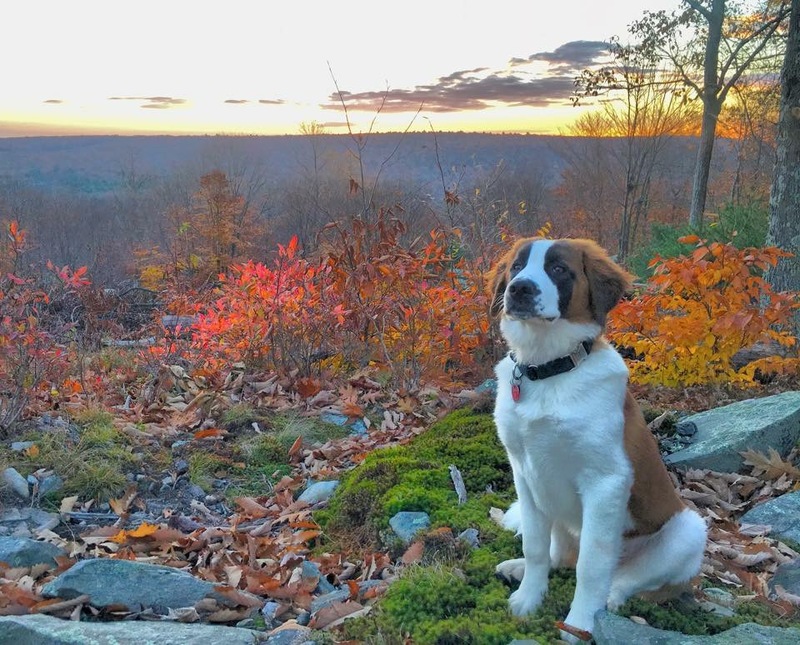 I’m a St Bernard, and I hibernate during the summer months– but when the temperatures start to drop, our stamina increases and we’re pumped to exercise. 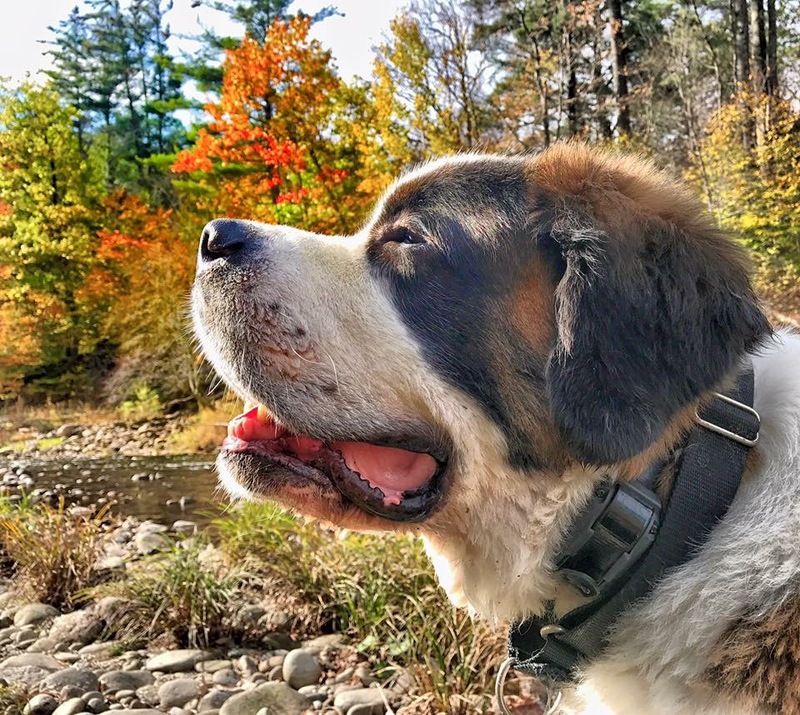 Since you’re bound to spend more time in the great outdoors to enjoy the magnificent fall foliage, here are a few safety tips to keep your dogs safe in Autumn. 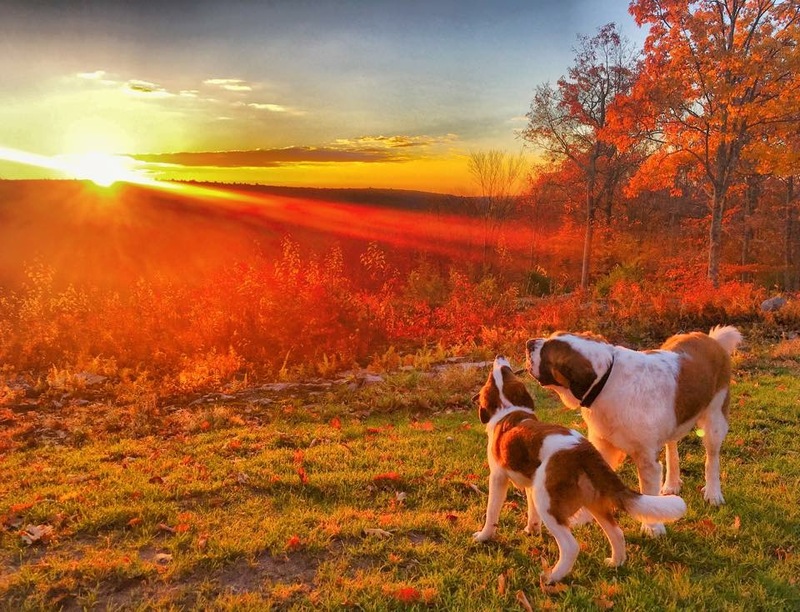 The sun will start to set earlier, and your evening walks with your dogs will be darker. Outfit your dog with LED collars so he’ll be easily visible in the dark. If your dog loves to play fetch, get balls that light up so you can play fetch with him in the dark! Autumn is a prime season for mushrooms, and although most species are not toxic, dogs are susceptible to mushroom poisoning due to their scavenging behavior. Since dogs do not have the ability to detect toxic mushrooms, keep them away from areas where it grows rampantly. 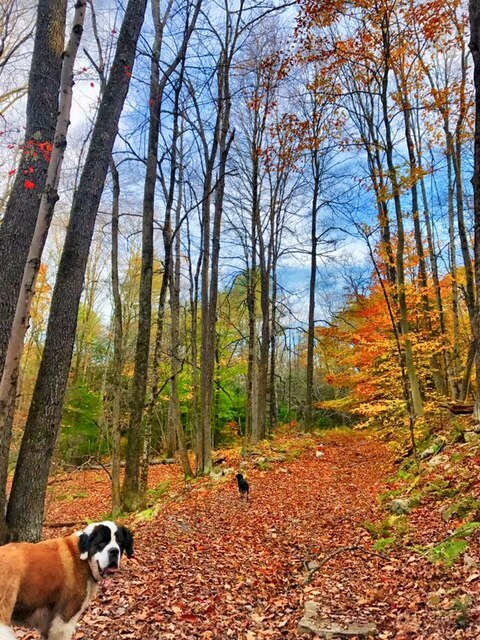 When hiking through the woods, keep him on leash and train them to perfect their recall while off leash. Snakes and Bears are more likely to strike in the fall as it is preparing for hibernation. Be aware of common types of snakes in your area and avoid the areas they most often inhabit. While hiking in the woods, be loud and let your presence be known to bears to prevent any encounters. As the weather cools, rats and mice starts to look for a warm place to survive during the winter months and the use of rhodenticides increase. Rhodenticides are highly toxic to pets and can cause fatalities if ingested. Be cautious of rat and mice poison in your neighborhood, and refrain from using rat poison in your home unless it is fully inaccessible to your dog. It can also be scattered in parks, basements and residential areas. Stay out of the grassy areas of housing projects, as rhodenticides are commonly used. Engine coolants are often changed during Autumn, and ethylene glycol based coolants are highly toxic to dogs. If you see any bright green/yellow spills on the streets, keep your dogs away from it. If you think that your dog has ingested any poison, call your veterinarian or ASPCA Animal Poison Control Center at (888) 426-4435 immediately. Ticks remain active even through fall and winter due to warming climates. Continue to use tick preventative medication to prevent your dog from tick borne illnesses. Decades ago, veterinarians may have recommended increasing a dog’s caloric consumption to prepare their body for winter. Our urban hounds live in comfortable, climate controlled environments. It is absolutely not necessary to increase their food ration, as most dogs are categorized as obese. In fact, if you dog is chubby, consider reducing their food intake, as your dog is likely to be exercised less during the cold winter months.